I've come to a realization that as the days go by, technology keeps improving and making life better for lazy people like me. Gone are the days when i'd spend over two hours washing beans with my bare hands in the kitchen (Say wetin happen??!!). At a point, i even dreaded days when i compulsorily had to make meals like Moi moi Or akara for the fam. It got so bad that i resorted to buying these meals from vendors outside whenever i craved for them to avoid the stress involved in the Preparation. 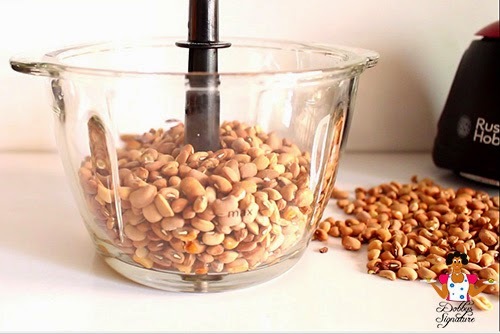 This method would definitely come as a relief to most people who find the traditional method of washing beans tasking. I've also got the full video on the process below. Step 2: Put the unwashed beans into a blender, Add water & pulse the blender for about 3-5 minutes. This doesn't break the beans but removes the skin. Na wa dobby! You too much,nne I'll try it the nxt time I'll mk moi moi.Meanwhile I tried your samosa pastry recipie this morning for my kids lunch @ school and it came out well with my hubby asking when I'll do it again.thanks so much and God bless. you're welcome sharon. I'm glad it turned out fine :). Thanks for the feedback. Please can you post Nigerian Meatpie recipe. Okay i will. The post would be up by next week. Nice one dobby but my blender is not like yours. I hope I will get the same result. This will definitely save time and energy. Thanks for sharing. I learnt about your blog from an old copy of WINGS magazine, so I decided to visit it. I like what I see. Well done! Thanks for the info, can i use the regular blender? Sure you can. I use my regular blender (the cup) quite often without stress. Nice my love! I appreciate this. hahaha!! Thank you matse :D.
Dobby you are too much, i comot cap for you. Good Job, where did you get the blender from? i've tried this severally with the regular blender and it turned out fine without spoiling the blades but it all depends on how strong the blender is. Glad you found the blog useful Llsyn :). Hi Dobby...Thanks for your influence...Where do we hit thumbs up for u tho? you're welcome Anon. you could give me a thumbs up on the youtube channel :)...Gracias! I use a Kenwood blender. Can it work pls. Babes, you re good, no doubt. I love moi-moi but i dread the painstaking process of soaking n peeling beans with my hands. I even had to resort to the already processed bean powders but the taste tho. :( Thanks for sharing this with us. I appreciate. Dobby u r d best ever!!! Keep d good work up. it's a mini chopper by russel hobbs. Ok, Moi moi and Akara now easy to do for me. Debby, do you have any idea what to do with insect eaten beans? I have like a 4 litter jerry can of beans that has been eaten by ants (kokoro). I made moi moi with some, tasted okay but my prince had to go to the loo immediately after eating it and same with a colleague. I no wan throw way the beans - advise ooo. I'm afraid there's nothing you can do about insect infested beans joladunni. Even if you grind it, it'd still feel grainy like something that has sand in it.